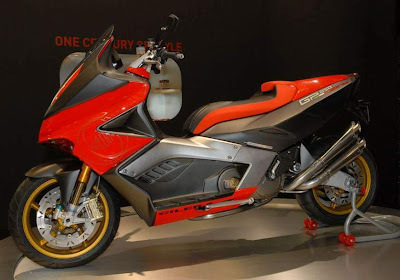 Gilera GP800, was one of the funkiest, the fastest scooter around, Piaggio Group added more style, forks and Öhlins Oro Series Brembo brakes with radial mounted four piston calipers, to create the Gilera GP850 Corse. With this new, special edition scooters, Gilera is celebrating 100 years of operation and 2008 250cc world champion Marco Simoncelli GP racing. GP 850 Corsa has inverted forks and Ohlins rear suspension, dual side mounted exhaust Crome and radial Brembo calipers are the same as model Aprilia Tuono. Tail is more pointed than ever GP 800, and a lamp placed vertically in a horizontal series production. The front is also new and currently do not have lights, but marked with a cheap air intake that mimics the heart of the Aprilia RSV. 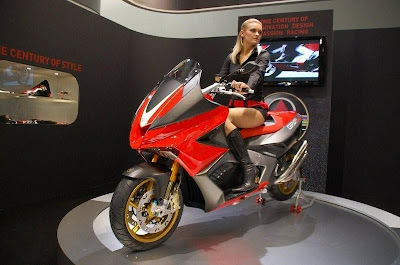 The GP850 Corse, which can seat two people (the back cover removed), has the same asymmetrical swingarm and chassis as that of the basic version, but the plastic bodywork has been redesigned and some bits have been added carbonfibre. A new exhaust system and twin halogen lamps excited completing small package.